Weighty Matters: Badvertising: KD Smart thinks you're KD Stupid! 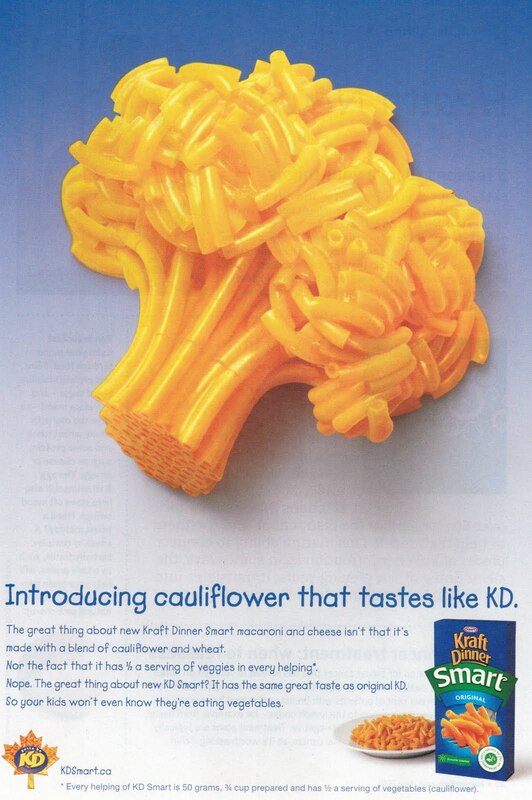 Kraft's got that in spades for trying to pass off Kraft Dinner as healthy by grinding in a smidgen of cauliflower. And so how much cauliflower is in a serving of Kraft Dinner Smart? Well I did my own quick analysis. I based it off the fact that Kraft Dinner Smart contains 10% of the %DV of Vitamin C whereas Kraft Dinner Original has zero. One ounce of cauliflower contains 22% of the %DV of Vitamin C so by my calculations that'd mean that per serving of Kraft Dinner Smart you're getting a grand total of 12.6 grams or just under half an ounce of cauliflower. Now the ad says I'll get half a serving of vegetables per serving of Kraft Dinner Smart. The thing is, a "serving" of cauliflower would be 1/2 a cup of cauliflower and therefore I ought to have 1/4 cup per serving. My calculations peg 1/4 cup of cauliflower as providing 19.25% of the %DV of Vitamin C. Therefore it'd be more accurate to suggest that you'd get 1/4 of a serving of vegetables per serving of Kraft Dinner Smart - two whole tablespoons worth. So what miraculous product comes from the combination of white flour and two whole tablespoons of cauliflower? You'll also find that you're getting ripped off in that Kraft Dinner Smart, which I'd be willing to wager is markedly more expensive than Kraft Dinner Original, has 33% less KD per box. So if you think it's KD Smart to pay more for a refined flour product with markedly more saturated fat, sodium and sugar than its already nutritionally atrocious counterpart but is made with two whole tablespoons of cauliflower per serving, then Kraft's done their job by using deceptive badvertising to render you KD Stupid.